Enterprise Architecture (EA) is a total concept for an enterprise structure consisting of coherent constructive, operative and decorative concepts (and their principles) for areas such as governance, business, information, applications, data and technology. EA is often used in organizations by means of a method, framework and dossier with products (like blueprints and landscape). We are used to talking about architecture when it comes to buildings and bridges. When it comes to organizations such as government institutions and enterprises, architecture is a whole new thing. And Enterprise Architecture is or seems to be different from architecture. But is it? Or is it not? In this sense EA has a lot of similarities with building architecture as in the architecture (total concept) of a building (structure). The symbol for Architecture is an arch. The symbol for EA is an enterprise with an arch. Today organizations are more busy with EA Frameworks than ever. Because of new technologies like IOT, Blockchain and Artificial Intelligence are coming forth more rapidly, Big Data Lakes being on the doorsteps, and not one software supplier can do it all, every organization has to make his current (AS-IS) and target (TO-BE) Enterprise Architecture visible. EA is more than just IT or business processes + software applications. It is the architecture of the whole of the enterprise. The definition states that an architecture is a total concept, thus a set of coherent concepts. So if you would visualize the architecture of a structure, you would see concepts grouped together. Often divided into layers. An EA often has layers like: governance, business, information (systems), application, data and technology or IT infrastructure. An EA example (in 2D) is presented here below. You see layers and on each layer you see concepts (the oval shapes are the icons for concepts). You can use this diagram to score the presence and maturity of concepts in your organizations. And very interesting is to see what the new unique concepts are in your organization, that put you in front of the competition. The diagram below (a form of 3D) shows many generic concepts that are present in every organization and implemented at different levels of maturity (m). Use the two diagrams to match your situation with it. The company that is only present online. No employees. No offices. eGovernment: the ability to do business with the government online and brick and mortar. eFulfillment: the ability to do every logistic action after a receiving an order smoothly and interchangeably online or physical. Our intention is not to provide a complete dictionary on EA here, but to provide only the most frequent used words in the field. 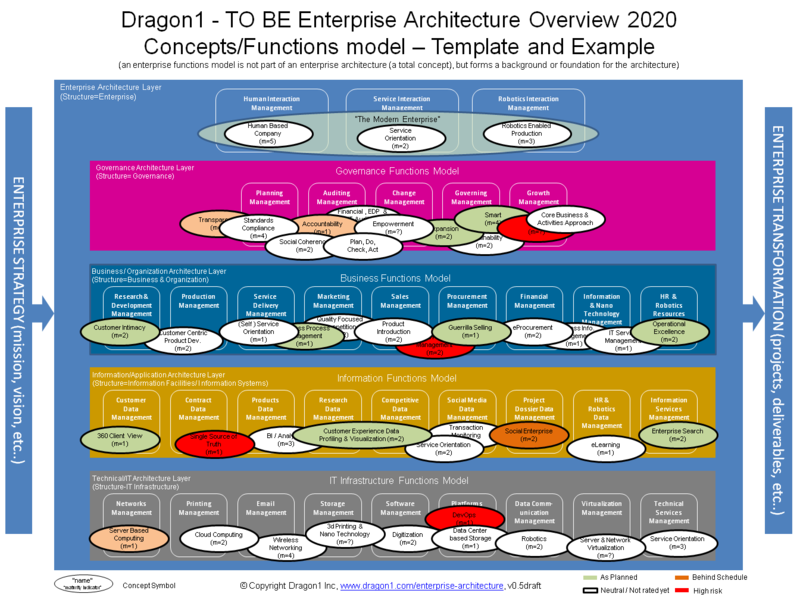 Do you want to create Enterprise Architecture Visualizations?